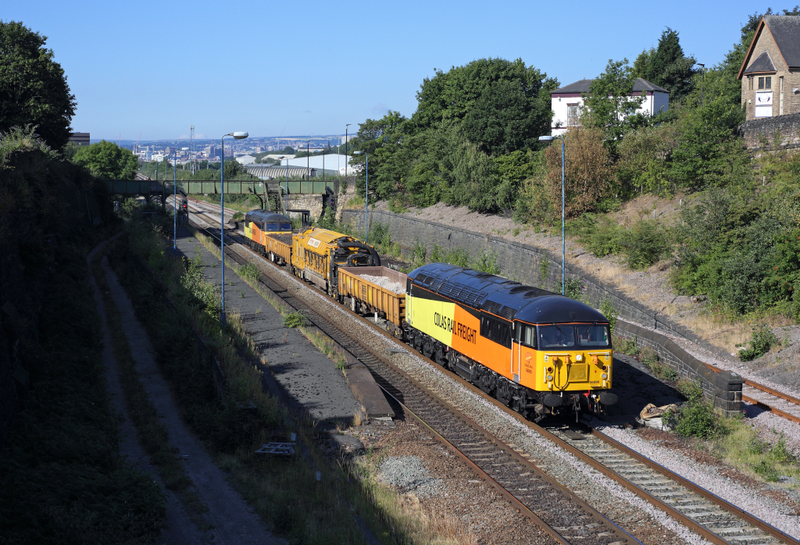 GBRf’s 56069, which was last week moved to the newly formed GBGS pool along with 56031, 032, 037 & 311, was hauled from Leicester Depot to Longport as 0M70 on Friday (13th July) with 66781 doing the honours. 56090 & 56094 appeared on the 6M32 Lindsey Oil Refinery – Preston Docks (Ribble Rail) & 6E32 return diagram from Monday (9th July) right through to Friday last week and can be found on the same working today. Four members of the class were engaged in engineering trains this weekend just gone. 56096 worked Saturday’s 6C80 2253 Doncaster Belmont Down Yard – St James Junction and Sunday’s 6C80 0800 Conisbrough GPLS883 – Doncaster Belmont Down Yard, 56090 & 56094 worked Saturday’s 6C52 2237 Doncaster Up Decoy – Sheffield and Sunday’s 6C52 0740 Sheffield – Doncaster Up Decoy whilst 56078 was paired with 60021 on Friday’s 6C55 2214 Crewe TMD to Blackrod (Chorley) and last night’s 6C55 0001 Euxton Junction – Crewe TMD return.